This table is made entirely by hand in my Johnson Vermont furniture studio. It is made of locally harvested and milled lumber, and finished in a locally produced green hand applied oil finish. The top has an amazing depth to it, and has a wonderfully silky feel under the hand. The knob is turned by hand from Ipe, the same wood that the pegs in the joints are made of. 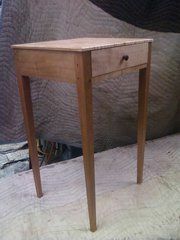 It is assembled with hand cut, mortise and tenon joints. The drawer is assembled with hand cut dovetails, and has a solid wood drawer bottom.